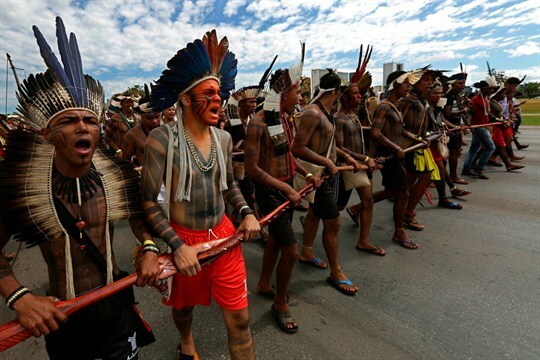 Indigenous Brazilians from various ethnic groups take part in a protest against the policies of President Michel Temer, Brasilia, Brazil, April 26, 2018 (AP photo by Eraldo Peres). RIO DE JANEIRO—The Brazilian ranchers staged their attack at night, bearing machetes, firearms and slabs of wood as they descended on the settlement inhabited by members of the indigenous Gamela tribe. According to some reports, the ranchers had assembled earlier in the day at a barbecue, where they drank heavily before setting out.